Sail through Norway’s Arctic past glaciers lit by the midnight sun to find a most mythic predator: the polar bear. This polar adventure is to the famed Svalbard Archipelago of northern Norway. Located between the North Pole and Norway, these islands are home to one of the greatest concentrations of polar bears on Earth. This region remains wild and pristine with its vast mountains, dramatic fjords, massive glaciers, and picturesque icebergs coupled with a myriad of Arctic wildlife. 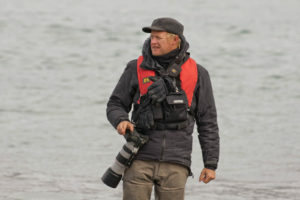 The primary mission of professional photographer leader Scott Davis is to provide you with skills and opportunities to produce quality images of unique Arctic wildlife and beautiful landscapes. • Adventure north of the Arctic Circle to seek out polar bears in 24 hours of daylight. • Zodiac cruise up to the base of striking cliffs to view nesting seabird colonies. • Slip into Svalbard’s many inlets and straits where larger ships cannot access. • Search for beluga whales, blue whales, humpback whales, and walrus. • Improve your photography skills with biologist-turned-professional-photographer Scott Davis. Jun 26 Travel to Norway. Jul 9 Arrive home, depending on flight schedules. Sam spent three years as the head of educational programs for the League for the Protection of Birds in France and has an incredible eye for spotting camouflaged birds and mammals in the cryptic tundra of Svalbard. 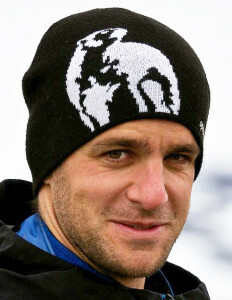 He specializes in guiding in the polar region, and his photos have won many prizes. His lectures about ice and the explorers of Svalbard, plus his knowledge of wildlife and wildflowers will keep you entranced during our voyage. Depart home and travel through Oslo, Norway on your way to Longyearbyen, Svalbard, Norway. Note: Cheesemans' are members of World Cetacean Alliance and abide by responsible whale watching practices. Arrive in Longyearbyen, Svalbard, Norway, today for an overnight stay before boarding the ship the next day. Longyearbyen is a Scandinavian town located on the island of Spitsbergen, the largest in the Svalbard Archipelago. Three other small settlements on Spitsbergen include another 1,000 people with most in the Russian settlement of Barentsburg. The rest of the 62,000 square kilometers of Spitsbergen, and the remainder of the archipelago, are largely pristine. While walking around Longyearbyen, you’ll be surrounded by tiny wildflowers beginning to bloom, and will encounter wildlife such as Svalbard ptarmigan, and snow buntings nesting on the outskirts of town. Common eiders, parasitic jaegers (Arctic skuas) and Arctic terns nest along the coastal flats adjoining the town. A few notes about Norwegian geography terms (as seen in many of the following place names): “bukta” means bay, “sund” means sound, “sundet” or “stretet” means channel or strait, “øy” or “øya” means island, “landet” means land or country, “breen” means glacier, and, of course, “fjord” or “fjorden” means fjord or inlet. Today you can choose to do some last-minute shopping, visit the excellent museum next to the Radisson Blu hotel, or simply explore the shore for birds. Side trips to other locales along the coast of Isfjorden are available. You’ll board the ship in the late afternoon. The waters around these islands are very calm compared to the Antarctic. Due to the shallow seas and the warming waters of the Gulf Stream, the climate is much milder than one would expect so far north. During this in-depth voyage, you will have ample opportunities to land ashore, Zodiac cruise, and view wildlife from the decks of our ship. Note: Flexibility is paramount in expedition travel. Our itinerary depends on the weather and ice conditions at the time of travel. We emphasize photography of polar bears and other Arctic wildlife along with unique and beautiful landscapes. Our small group size gives us the flexibility to stay at a perfect photographic moment for however long needed. Your expedition will have an incredible amount of freedom to explore the Svalbard archipelago. In the land of 24-hour daylight, you’ll search for Arctic wildlife of all shapes and sizes. The region hosts a myriad of species that will present you with great opportunities for your chance to capture world-class images. Your small group expedition will have the time, flexibility, and freedom to cruise around the shores. When you land on shore, you’ll have the opportunity to hike, explore, and photograph wildlife and landscapes. You’ll visit fantastic bird cliffs where black-legged kittiwakes, northern fulmars, and several species of alcids breed which include dovekie, black guillemot, thick-billed murre (Brünnich's guillemot), and Atlantic puffin. You’ll seek out polar bears, seals, and ivory gulls where ice abounds. You’ll also have time to get inland a bit to see goose colonies – pink-footed and barnacle – along with common eider, king eider, and long-tailed duck (oldsquaw). While walking, stay alert for nesting shorebirds, such as red phalaropes, terns, and skuas. Arctic terns and parasitic jaegars (Arctic skuas) are quick to dive bomb if they are disturbed. While on land, keep an eye out for Arctic fox and Svalbard reindeer (an endemic subspecies with very short legs) foraging during the plentiful summer months. Liefdefjorden ~ You may sail to the mouth of Liefdefjorden and go ashore for a walk on the tundra of Andøya. Many geese feed on the tundra lushness at this time of year and you may also see the less common king eider. Monacobreen, with its five-kilometer-long face, is an impressive glacier at the end of this large fjord. Polar bears have been seen on the glacier, and the surrounding sea is a favorite feeding spot for thousands of kittiwakes. Raudfjorden ~ Along the north coast of Spitsbergen, Raudfjorden is a beautiful fjord with spectacular glaciers. It is home to ringed and bearded seals, seabird colonies, and surprisingly rich vegetation. Ytre Norskøya ~ The small island of Ytre Norskøya, on the northwest coast of Spitsbergen, has an accessible breeding ground of seabirds and is a beautiful place to hike along the colorful lichen covered cliffs. Krossfjorden and Kongsfjorden ~ On the west side of Spitsbergen, Krossfjorden and Kongsfjorden are good places to Zodiac cruise along the famed Fourteenth of July Glacier or Fjortende Julibreen and other beautiful glaciers. Alkhornet ~ At the mouth of Isfjorden, the largest of all Spitsbergen’s fjords, you may land at Alkhornet where Arctic foxes search the cliff base for fallen chicks. Also at the base of the cliffs, Svalbard reindeer graze the luxuriant wildflower-covered vegetation, creating some of the best reindeer photography in the archipelago. The entire group will disembark the ship in Longyearbyen around 9 am and either travel to the airport or into town for those departing later in the day. If you wish to extend your stay, we are happy to book a hotel in Longyearbyen for you (not included, subject to availability). Information about transfers and hotels in Longyearbyen and Oslo will be provided in your trip materials. Arrive home depending on your flight schedule. 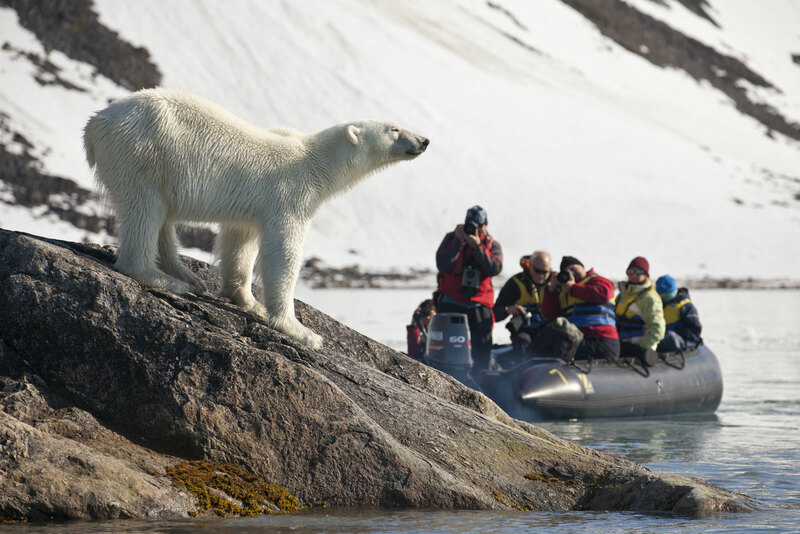 Sail through Norway’s Arctic past glaciers to find a most mythic predator: the polar bear. We chose the most well-equipped and comfortable ship that sails the Svalbard archipelago in the small ship category. 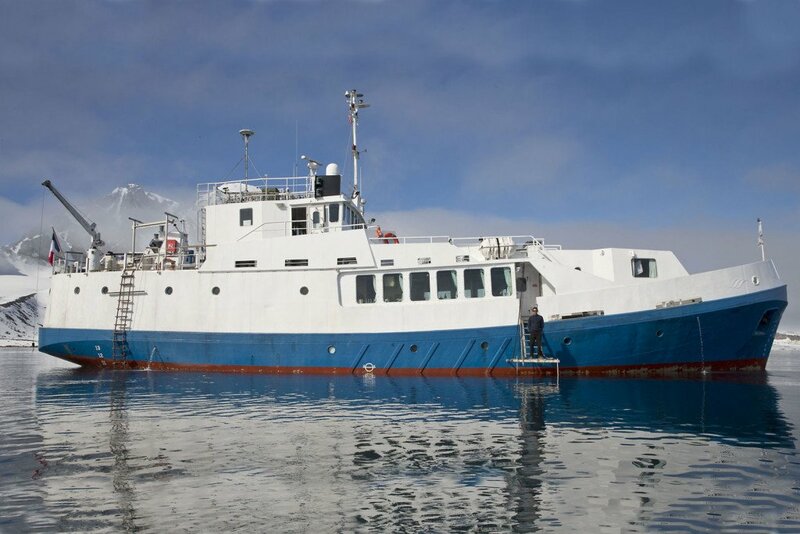 The ship is 34 m (112 ft) with an ice-strengthened hull and shallow draft that enables us to explore shallow inlets that where other ships cannot go. The cabins for 12 passengers are cozy and comfortable, and each person has his/her own private cabin (if you choose) and each cabin has its own private bathroom facilities. See additional photos from our participants. Costs are per person, single occupancy, not including airfare, singles extra. See Included and Not Included sections for more details. We reserve the right to charge for cost increases that occur between when we set tour prices and the date of travel, for example, changes due to the cost of lodging and transportation. If you are a single traveler and you desire, we will find a roommate for you at the hotel in Longyearbyen. If you would like a single room, there is an additional cost. All leaders, transport, park entry fees, landing fees, and permits for all activities unless described as optional. Breakfast on June 28 at the hotel and meals aboard our ship from dinner on June 28 through breakfast on July 8. Nine days and ten nights aboard our ship. Lodging the night of June 27 in Longyearbyen. 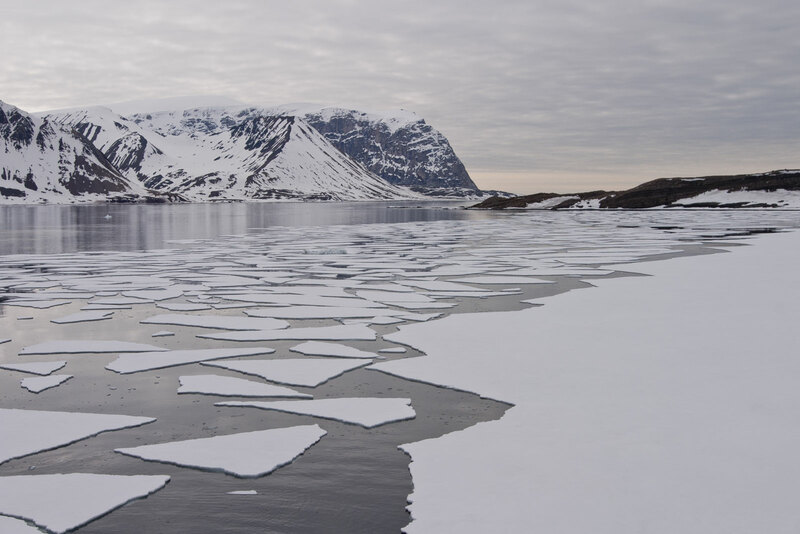 A group transfer from the hotel in Longyearbyen to the ship on June 28 and a group transfer from the ship to the airport or into town upon disembarkation on July 8. All airfare, airport and departure taxes, and excess baggage fees. Airfare is approximately $1,600 to $2,900 from the USA to Longyearbyen, Svalbard, Norway depending on origin. Lunch on June 28 in Longyearbyen. Transfer from the airport to the hotel on arrival in Longyearbyen. Gratuities – tipping is, of course, discretionary, however we suggest budgeting about $20 to $25 per participant per day for June 28 to July 7 (about $200 to $250 total per participant) to be distributed among the ship’s crew and assistant guide. Emergency medical, but it is required for you to purchase. Read more about travel insurance. Items of a personal nature such as laundry, telephone calls, medical costs or hospitalization, room service, alcoholic and other beverages, items not on the regular menu, etc. If you have special dietary needs, please indicate them on your Reservation/Release Form. You will be visiting the Arctic during its summer with 24 hours of daylight. Weather patterns may be highly variable, so bring appropriate attire to handle a mix of weather conditions including wind, snow, rain, and sun. Expect temperatures in the 30s and 40s °F (0–9° C), but weather fronts can cause temperatures to either drop further or rise to the 50s and low 60s °F (10–17° C). Keep in mind that we can only relay weather trends. Climate change has created less reliable weather and more extreme weather conditions everywhere, so be prepared for changing conditions. You must be fit enough to get from the ship into the Zodiacs via a six-foot ladder with staff assisting you above and below. Once ashore, you must be able to get in and out of the Zodiacs including occasionally on a rocky coastline. There will be opportunities for short, relaxed hikes, usually of less than a mile over varied terrain (tundra, flat areas, hilly and grassy areas, or rocky slopes) depending on our location. The longest walks will be about one mile (1.6 km) and, at times, uphill for about 20–30 minutes. Remember you will be carrying all of your camera gear; to prepare, we suggest you practice carrying your equipment for the amount of time and distances that you may encounter during this trip. Landing details will be given in advance of each landing and you will always have complete freedom to participate or not participate in the landings and nature hikes. Airfare is not included in trip costs. Detailed logistical information and the contact information for our recommended flight-ticketing agent are included in the Trip Materials we will send you. Please let us know if you are arriving earlier or staying later in Longyearbyen, as we are happy to assist you with any extra overnights that you might want to arrange. Flights you (or a travel agent) book: Arrive in Longyearbyen, Svalbard, Norway (LYR) on June 27. For most, this means departing home on June 25 or 26. Depart Longyearbyen, Svalbard (LYR) after 11am on July 8, as we debark from the ship at 9am and recommend at least one hour to check-in before departure. Why is this the best ship? With only twelve passenger cabins, our ship is smaller than most ships in Svalbard, allowing us to travel farther and into smaller inlets than other cruise ships. Our small group size gives us the flexibility to stay at perfect photographic moments to capture world-class images. This means that we can see things other ships miss. With two leaders and only twelve passengers, you will receive plenty of individual attention. We also use enough Zodiacs to allow plenty of room for our travelers and their photography gear. Why do we sail in June and July? A decent amount of sea ice is present during this time, which provides a good platform to walk onto the shore. When this “ice platform” melts, it is almost impossible to climb onto the shore and over the shoreline banks, which decreases the number of landing possibilities. Polar bears stay with the sea ice and actively look for and hunt seals, thus providing more opportunities to see them, and very large aggregations of seabirds nest along the cliffs during this time of year. Will we see anything different in June vs. July? Because our two expeditions visit the archipelago back to back, spanning four weeks, your wildlife encounters will not vary much, but the July expedition may have slightly more opportunities to see wildflowers. Don’t let a fear of seasickness scare you away! For all but the most sensitive, seasickness is rarely a problem in this region. It’s a good idea to bring medication if you get seasick or are unsure, but you may find that you do not need it after a couple days once you have your “sea legs.” Even those who have experienced seasickness reported that the incredible wildlife and overall experience were well worth the temporary discomfort. Read our suggestions for coping with seasickness and contact us if you have any concerns. Non-smoking policy: We have a strict non-smoking policy. Smoking is not permitted at any time or any place during our tours. The crew aboard the ship smoke in designated smoking sections only. Itinerary route: The itinerary route, stops and plans are subject to change by unforeseen circumstances beyond our control, such as weather or road conditions. Travel to remote places is exciting, but it is important to understand and accept the risks, both medical and logistical. Minor medical problems can usually be treated, but because we are often far from medical facilities, there can be no expectation for immediate medical treatment or evacuation, even in cases of trauma. Anyone with health problems needing close medical supervision should not consider going on this tour. Bring enough medication for the duration of the trip for any chronic medical needs, since pharmacies are usually not available. When you send your deposit and signed Reservation/Release Form, you certify to us that you do not knowingly have any physical or other conditions that would create a risk for yourself or for other trip participants. An excellent tour, well organized, expertly carried out on a lovely ship with a fantastic crew. The trip led by Scott Davis was outstanding in all aspects. No opportunities to see wildlife were left unexplored, and several times we were still out in the Zodiacs at 11pm, not wanting to leave the Polar Bears!